Nursing isn’t just about procedures and medications; it is about taking care of a person, both physically and psychologically. It’s about calming fears, listening to concerns, and helping the entire person to feel better. As a nurse myself, I know what she is talking about. Sometimes it seems that other fields of medicine focus on one aspect of the patient, but the nurse pulls them all together. 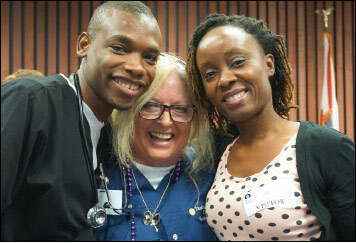 Judy says she tells her students, “It doesn’t matter if you are a CNA (certified nursing assistant), LPN (licensed practical nurse), RN (registered nurse) or ARNP (advanced registered nurse practitioner), when the patient sees you, you are ‘the Nurse.’” A nurse brings comfort, and pulls it all together with the other disciplines and make sure all the needs of this person are met. Judy told me about a student of hers who completed the PCA course and began working at All Children’s Hospital as a CNA. She came back and completed the practical nurse course and got her LPN license, and then went on to earn an RN license through her employer. The patient care assistant program is 290 hours long (about 3 months) and will earn successful candidates a CNA certification. 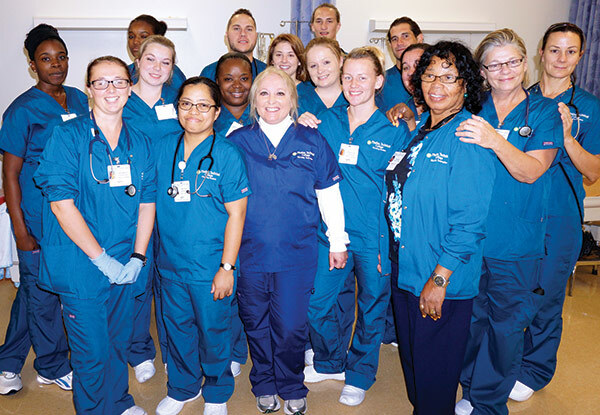 Credits also apply toward the practical nurse program, which is 1350 hours (less than 6 months) and qualifies graduates to take the state LPN exam to gain licensure. Credits can be earned toward an associate’s degree as well. Deanna Foster is a successful graduate of the PCA program at PTEC, and has passed the Florida state requirements, earning a CNA certification. Her passion for her new career path is evident while speaking with her. Deanna has always loved helping people, even as a child. “I have always had a kind and compassionate heart and love working with people and animals,” Deanna said. While searching for possible career paths, she thought about becoming a veterinary technician. The closest program for this was in Miami and that was too far. So she looked into becoming an early childhood teacher, but even though she loves children, she found that to be a bit too stressful. During this time, she was helping her family to take care of her grandmother who had dementia. Deanna found that her grandmother was responsive and cooperative with her and Deanna really enjoyed working with her. “I really like giving elderly people a sense of belonging and purpose,” Deanna related. She discussed with her aunt (a registered nurse) the idea of becoming a nurse herself. 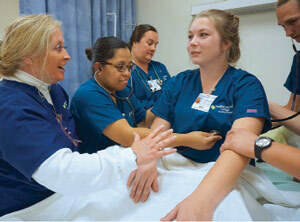 They decided that entering into the field as a CNA would be a good way to get a sense of what nursing is. Deanna discovered that PTEC had a very good program which was close by, affordable, and fit her needs perfectly. With her family’s encouragement, she entered the program and completed it on November 12th this past year. 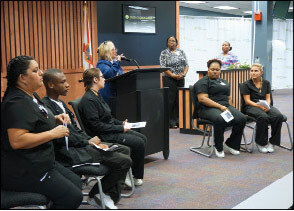 PTEC has candidates take the two-part Florida State certification exam prior to course graduation. Those who pass successfully can take the documentation to prospective employers while waiting for their certificate to arrive from the state, which can take a while. 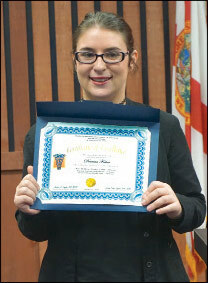 Deanna graduated from the program in November and is currently looking for a position in a skilled nursing facility. She plans to work as a CNA for a while to gain some real experience before continuing her education and achieving her LPN. When she isn’t working, Judy finds great pleasure and relaxation in volunteering. She works at The St. Petersburg Free Clinic on Tuesday evenings when the Primary Care residents from Bayfront Hospital come to see patients. The doctors and nurses collaborate on ways to help these patients. “I learn a lot from figuring things out with them. I find it very informative and a great resource,” Judy says. 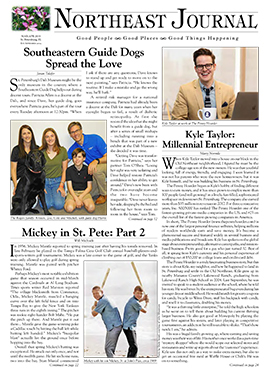 The St Petersburg Free Clinic provides no-cost primary care for adults who don’t have health insurance and don’t qualify for Medicaid, Medicare, or county subsidized health care. On Thursday evenings, Judy volunteers at All Children’s Hospital in the NICU. “I have to get my baby fix!” She loves those little babies so much, in fact, she adopted her son from a neonatal unit in South Carolina! He is now a grown man of 28, so she takes care of new babies to get her fix. The NICU at ACH has 97 beds and comprises the entire sixth floor, so it can be a busy place with lots of babies to care for. On the day I spoke with Judy, she told me that the motivational quote she had used that morning was from Joe Madden: “Integrity needs no rules.” After talking with her, I believe this sums her up. 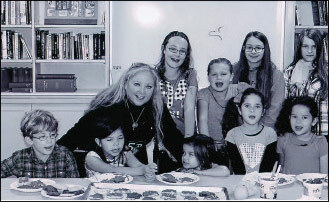 Judy encourages her students to volunteer in the community because giving back is a great stress relief and it can be so rewarding on both sides. 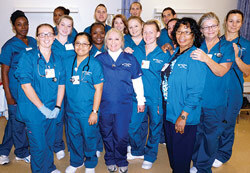 It’s plain to see that Judy’s love of nursing is shared with her students, family, and the community. In a society where ‘self’ is promoted above others, she is really giving back to all of us by mentoring future nurses to do more than just a job, but to be true caregivers. To volunteer at the St Petersburg Free Clinic, download an application at stpetersburgfreeclinic.org/get-started or contact Angel Schumaker 727-821-1200 x114.To volunteer at All Children’s Hospital visit www.allkids.org/foundation/get-involved/volunteer-in-the-hospital.